Countless tragedies, disasters, and catastrophes, both recorded and unrecorded, have struck the world since the beginning of time. The tragedy of Karbala is one of them but its story is the most remarkable of them all. It is remarkable because it defies a law of nature. Human nature seeks happiness, and eschews sorrow. It does everything to efface the memory of sorrow, and it does everything to treasure pleasant memories. In the tragedy of Karbala, a reversal of this law is clearly noticeable. Fourteen centuries have passed since the tragedy of Karbala took place, but its sorrow is as fresh today as if it occurred only yesterday. Time has failed to make any dent on the sorrow for the tragedy of Karbala. 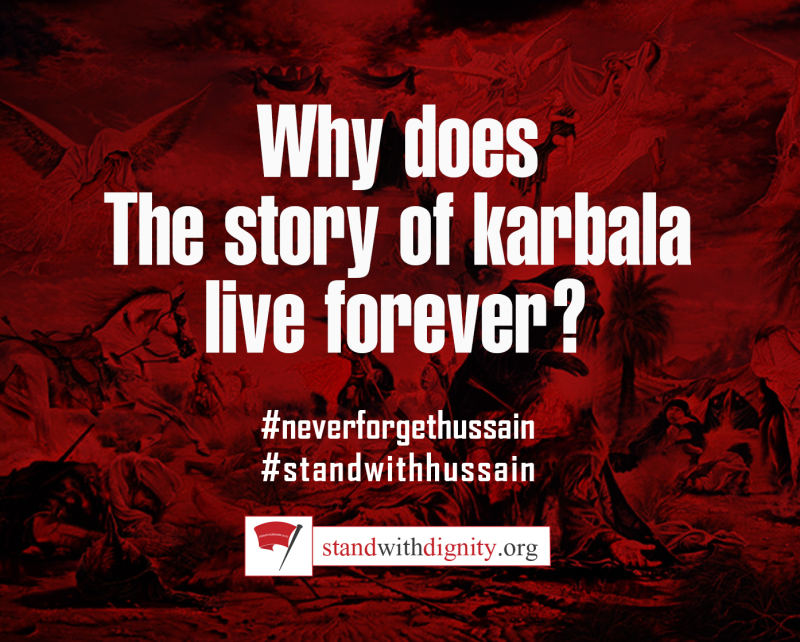 Husain, the younger grandson of Muhammad (s), the messenger of God, and the Prophet of Islam, was the central figure in the tragedy of Karbala. 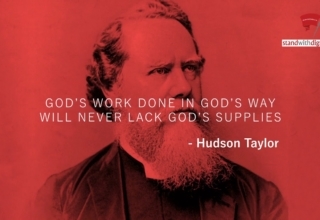 His prayer, his sacrifice, his life and his death, all were for God, and for God alone. Husain offered his sacrifices to win the pleasure of God. His sincerity and the sincerity of all his companions who offered their lives as sacrifice, pleased God so much that he made all of them immortal. Why did Husain offer these sacrifices? He offered them for a sublime ideal; viz, to save Islam, the religion promulgated by his grandfather, the Messenger of God. Though Muhammad (S) the blessed Messenger, had made Islam viable in his own lifetime by his own sacrifice, after his death there was the inevitable reaction of paganism against it. When Islam was threatened with destruction, by its old enemies, Husain put himself between it and them. He made himself a shield for Islam! 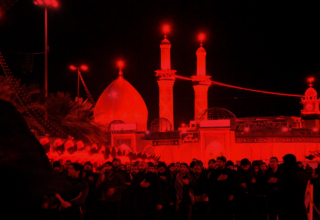 The tragedy of Karbala had both remote and immediate causes. The immediate cause of this tragedy was the death of Muawiyah in 680 AD. Upon his death, his son, Yazid, succeeded him as Caliph. Yazid’s succession was a flagrant violation of the laws of Islam, and a contravention of the bilateral agreement between Imam Hasan (A) and Muawiyah. His accession to the throne was an unmitigated aberration. The historians are unanimous in stating that Yazid had no faith in God, his Apostle, nor in the Day of Judgment. He made a mockery of prayer and derided those Muslims who offered devotions to God. He drank wine and openly flouted the commandments of God. He lived a life of a dissolute and a wanton. upon the aims for which it is offered. Yazid reigned for three year’s. In the first year he massacred, in Karbala, the members of the family of the Prophet. In the second year, his army attacked and occupied Medina. For three days, Medina was given over to the Syrian soldiers, who went on rampage. They killed thousands of the companions of the Prophet and Huffaz of Qur’an (people memorized the Qur’an). Among those killed were scores of the veterans of the Battle of Badr. They turned the Mosque of the Prophet into a stable for their cavalry, and indulged in shameless acts during the siege of the holy city. The survivors of Medina were forced to give a pledge of loyalty to Yazid, and they had to declare themselves as his slaves. During the third year of his reign, Yazid laid siege to Mecca. His troops threw flames and rocks from mangonels catapult at the Kaaba, the House of God. The Kaaba was partly burned and partly demolished. Such was Yazid. The leader of the reaction of polytheism against Islam; such was the man who had demanded an oath of loyalty from Husain. 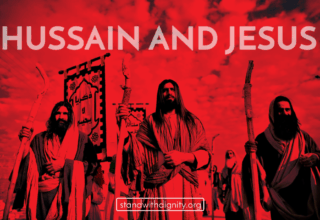 Who was Husain? Husain was the younger son of Ali ibne Abu Talib and Fatima Zahra (S), the daughter of Muhammad, the Prophet of Islam. 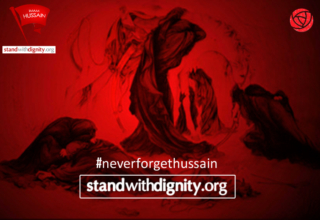 Husain was a symbol of purity. It is mandatory for Muslims to love him. Muhammad (S) called him and his elder brother, Hasan, the Princes of the Youth of Heaven. Both of them, in childhood, rode upon his shoulders whenever he went out. After the death of the Prophet, his grandfather, Ali ibne Abu Talib, his father, and Hasan, his brother, Husain was the guardian of Islam. One thing he could not do was to acknowledge a profligate like Yazid as the successor of the Messenger of God, and the leader of all Muslims. He knew that if he gave the pledge of loyalty to Yazid, his act would be interpreted by all Muslims as his endorsement of the caliphate to Yazid, and of all his anti-Islamic and inhuman deeds. He therefore, refused to give such a pledge, for this refusal, he had to pay a very high price, yet he paid it willingly. Husain had to leave Medina, the last resting place of his grandfather, his mother, and his brother. He sought sanctuary in Mecca, the House of God, but did not find it there. Yazid had sent thirty assassins disguised as pilgrims to kill him. Since Husain did not want the sanctity of the Kaaba to be violated, he vacated Mecca two days before Hajj, and left for Iraq with members of his family, and a handful of friends. They were intercepted by a contingent of Yazid’s forces. This contingent was made up of 1000 warriors. They had run out of water, and were extremely thirsty. Husain gave them water to drink, not only to the men but also to their horses. Husain resumed his march, and reached Karbala in Iraq on the 2nd of Muharram of 61 AH (AD 680) His companions pitched camp on the bank of the river Euphrates. Immediately, new troops began to arrive from Kufa, the provincial capital. These troops forced Husain to move his camp away from the river. 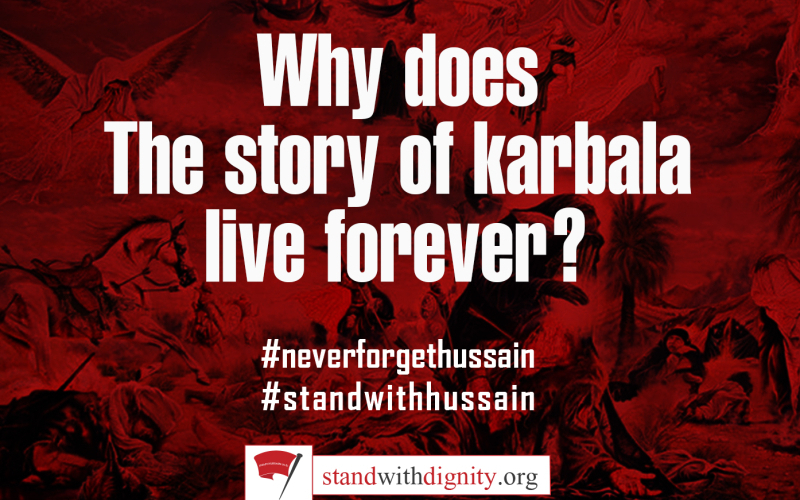 Husain’s companions were fewer than 150, including men, women and children. Now thousands of the enemy soldiers surrounded them. From the 7th of Muharram, access to water was barred to them, and there was no water in Husain’s camp from that date. From the 8th of Muharram, children in the camp were crying for water as they went from one tent to another in the vain hope of finding it somewhere. On the morning of the 10th of Muharram, Umar bin Sa’ad, the general of Yazid’s forces, shot an arrow towards the camp of Husain, thus signaling that hostilities had begun. The companions and the friends of Husain were the first to go into the field to face and check the advancing enemy. All of them fought heroically against overwhelming odds, and one by one all of them were killed. By midday, the last of them was gone. Then the children of Abu Talib, the uncle of the Prophet, took the field. The sons of Aqeel ibne Abu Talib were the first to be killed. After them the two sons of Zainab, the sister of Husain, and their cousin, Qasim ibne Hasan, dyed the sands of Karbala with their blood. Abbas ibne Ali, the younger brother of Husain, was the standard bearer of the little caravan of Husain. He could not see the distress of thirsty children any more, and made one desperate attempt to bring water for them. He fought his way through the enemy pickets to the river, filled the goatskin with water, and spurred his horse to return to the camp. But his enemies were resolved not to let the water reach the camp of Husain. They surrounded him, and severed first his right, and then his left arms. The water bag still hung from his shoulder, but with his arms gone, he was unable to protect it. Soon an arrow pierced the goatskin, and a fatal blow upon his head from a mace put an end to the last faint hope he ever had of taking water to the camp to satiate the thirst of the children. Ali Akbar was the eldest son of Husain. He was 18 years old, the spellbinder of Karbala. He bore a most striking resemblance to Muhammad Mustafa. When he charged to enemy, many of them perished, but eventually a horseman hurled a spear at him that caught him in the chest, and killed him. Husain was now left alone. He called out if there was anyone still around to come to his aid. His second son, Zayn al-Abidin, was unconscious from protracted sickness. His youngest son, Ali Asghar, now six months old, was without milk or water. It occurred to Husain that he ought to ask the enemy to give some water to the infant. He brought him out of the tent, shading him from the sun with his cloak, to make a silent appeal to the enemy for water. But in response to this appeal, the enemy shot an arrow which transfixed the throat of the infant, and killed him. Husain had not withheld even an infant from sacrifice. Now the only thing left to sacrifice was his own life. As he was contemplating in silence the scene of vast desolation around him, the enemy charged at him. He repelled each wave of attack. But the enemy kept regrouping, and renewing the attacks. He felt faint from multiple wounds, thirst, exhaustion, and loss of blood. Towards mid-afternoon. The enemy surrounded him with sword and spear, and attacked him at close range with arrows and rocks. At last, he was unhorsed. Shimr, an officer in Yazid’s army, noted for his brutality and cruelty, moved towards Husain, his hand grasping a reeking sword. He severed his head, and spiked it on a lance. After his death, the troops of Yazid plundered the camp. They burned the tents. The children ran out of the burning tents until nothing was left but ashes. They put Zainul-Abidin, the only male survivor of the massacre, in chains, and made him a prisoner. That evening was the most awful evening in history. Except for Zainul-Abidin, all the male members of the House of the Prophet of Islam, and all the companions and friends of Husain had been slain. And the battlefield was strewn with their bodies. The desert sand was stained with crimson blotches of their blood. All the protectors of the caravan of Husain had gone. In their absence, Zainab, the sister of Husain, took charge of the duty of a protector. She gathered the little caravan of the orphans and the widows together. 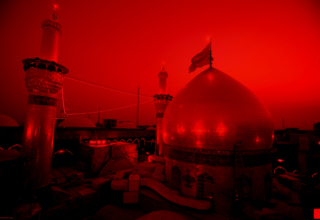 That day had claimed from Husain, the most sacrosanct blood in all creation! That blood built strength into the structure of Islam, and made it invulnerable and everlasting. The story of the sacrifices of Husain will, therefore, live as long as Islam lives, and as long as there are men and women who love courage, justice, truth, and devotion to principle such as no one else did before or since. May God bestow these blessings upon all members of his family and his gallant companions and friends.